The Wire from Solid option can be used to create Wireframe entities from solid models. Select Wire from Solid from the Tools>Extract submenu. The Create Wireframe dialog box appears, through which you can specify how to desolidify the body(s). Once the settings in this dialog have been configured, click OK. Select the body(s) from which to create wireframe geometry. Specify the entities to extract the wirefram from. The following entity types are available: Solids and/or Sheet Bodies, Faces of Solids and/or Sheet Bodies, and Edges and Flowlines of Solids and/or Sheet Bodies. Edge Curves - When checked, edge curves will be created. An edge is bounded by one or more vertices. Edges are used to represent the wires in a wireframe body and the boundaries of faces in a solid body. Silhouette Curves - When checked, silhouette curves will be created. Silhouette curves are defined as curves lying on a surface and following a path where the surface normals are exactly perpendicular to a given view direction vector. If you choose this option, you will be prompted to choose the vector. Flowlines - When this setting is checked, the specified number of U and V flowlines will be created. Flowlines are additional lines that can be used to represent the surface topology of a model. 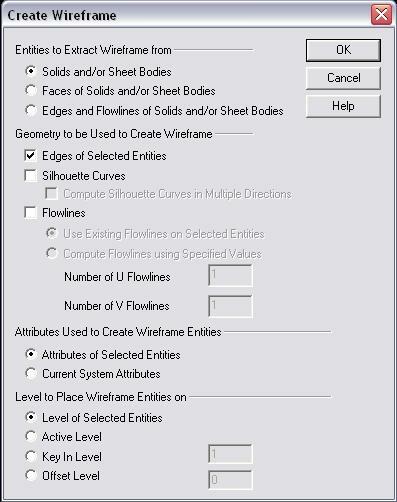 Specify whether to use the attributes of selected entities or the current system attributes for the created wireframe entities. Specify where to place the extracted wireframe entities. The following options are available: Level of Selected Entities, Active Level, Key In Level, and Offset Level.